My mother passed away in August 2010; she died in the middle of the night in an assisted living facility not far from our home. My father passed away 24 hours ago; he died peacefully in his own bed in this house just like he wanted to. He was two months shy of his 93rd birthday. Care giving has been the most challenging task I have ever engaged in, physically, emotionally and spiritually, yet I emerged stronger in each of those three pillars when it was over. 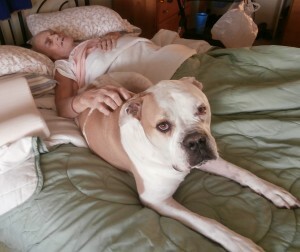 Mrs. tVM and I walked into his room at 4AM yesterday morning to administer his medication. I stared at his lifeless body as she put her hand to her mouth to contain the sob. I placed my hand on his forehead. He was cold. We stood by his bedside for several minutes coming to terms with the fact that his spirit had departed. Mrs. tVM had left the window open just a crack this past week for that very purpose. Twenty-four hours later, I still remember that conversation with Bill. “You’ll be glad you did …” “No I won’t Bill …” As I recall that conversation, I realize that Bill was right and I was wrong. I sit here today at peace with myself. Bill was right. I’m glad I did what I did. No one and no thing can ever change my mind. Care giving is not an easy thing. While it brought out the worst in me, I am certain it also brought out the best in me. I know I am stronger physically, spiritually and emotionally than I have ever been in my life. I have my father to thank for that. When Bill responded to my email yesterday informing him that my father had passed, he sent a link to an interview with Jim Caviezel, the actor who portrayed Jesus in Mel Gibson’s masterpiece The Passion. “I’m sending you a video that might be helpful at this time,” he wrote, “I found it to be extraordinary.” Mrs. tVM and our youngest son sat quietly for 30+ minutes and watched it. Once again, Bill was right: the video was helpful and quite extraordinary. I invite you to watch it. If you are on a time crunch, please pick up the discussion at the 37th minute and watch it until the end. Mr. Caviezel concludes with a poem by Walt Huntley, a poem that legendary Coach John Wooden quoted at his hall of fame induction. It’s called God’s Hall of Fame. I think that is where my father is right now. Ah ! At last I had the time, no, took the time, to re read your well expressed email, Gene and I took the time to watch the John Caviezel interview — the most important 39 minutes that I have spent for quite some time, I would have responded here sooner, but I felt so compelled to forward this to older family members and to dear Christian sisterinlaws. Many blessings for us in your sharing your experience and this extraordinary witness of the exchange of love between God and John Caviezel. Gene, this is the most, the best way to share God’sWord, EVER. Thank you for sharing! Iam forwarding this clip to all my e’contacts. Thanks for you thoughts and prayers, Sister Michelle. My dad’s name is Howard. No, Caesar is our dog and he is our best friend. He came to us in 2007 in Missouri. He is an American Bulldog. Animals are more spiritual and sensitive than we are. 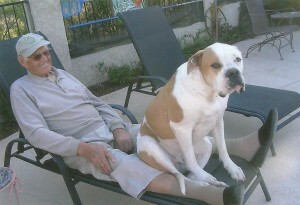 Caesar was always very comforting to my father. He is the youngest of our three dogs. Steve and I are so sorry for the loss of your dad! We remember him well when he and your mom would attend the soccer games with you and your family! Take care and know you are all in our thoughts and prayers! Thanks, Kathy. Stef and family arrive tonight from Minnesota. Best to you and Steve. You gave your father and mother your love and care. Sometimes in expanding love, sometimes in challenging difficulty. William Blake, the poet, said that we are placed on earth to learn to bear the beams of love. You and Marie have borne it well! As Stephen King wrote in The Stand, “With God on our side, we will stand.” I have fallen many times. Perhaps that is why I am so drawn to the seventh station. I thank God every day that I have people like you to encourage me to get back on my feet. I have been strengthened in every aspect of my life by an experience that I will forever cherish.